The pictures below — of items around my house — should convince you of my fascination (obsession?) with binary numbers. The binary value of 137 represented in lights. 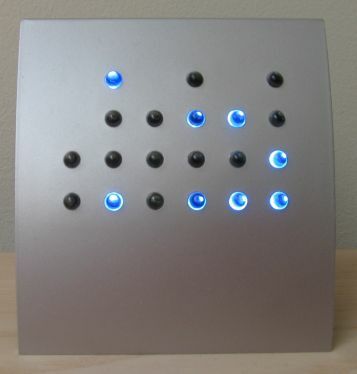 Binary clock showing the time 9:05:53. 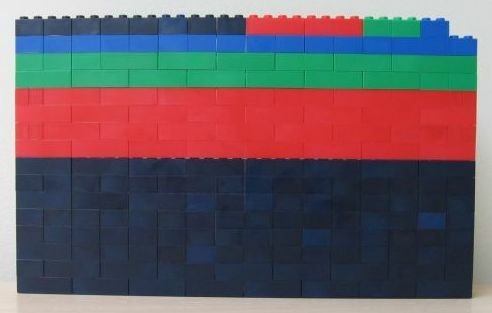 Lego block representation of the number 255. Another block representation of the number 255. This following structure — the “binary towers” — also represents the number 255 with the first eight nonnegative powers of two. 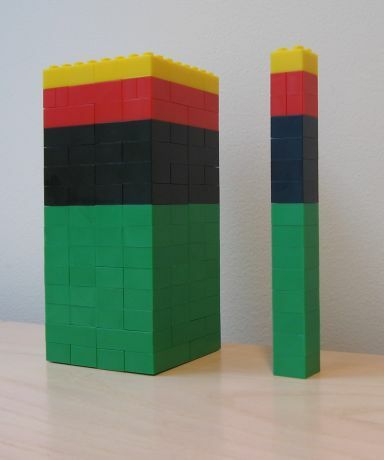 The wide tower represents 240 (128 + 64 + 32 + 16), and the skinny tower represents 15 (8 + 4 + 2 + 1). This is like showing a byte’s two nybbles explicitly, kind of like representing the number in hexadecimal form. Yet another block representation of the number 255. Block "city" with building heights that are powers of two. Hey Rick, Your fascination with binary numbers goes back at least to time you once told me all about a method to represent all negative and positive integers without a negative sign, using base -2. It would make a good article. Great website. You need a hit counter on the home page–displayed in binary naturally. Or you could have lights turning on or leggo towers getting bigger! Cool, I don’t remember that conversation, but I was talking about negabinary numbers. That is on my list of articles to write – thanks. BTW, if this were 1998, a binary hit counter would be a great idea. But hit counters went the way of the Dodo. Use the internet much ;)? 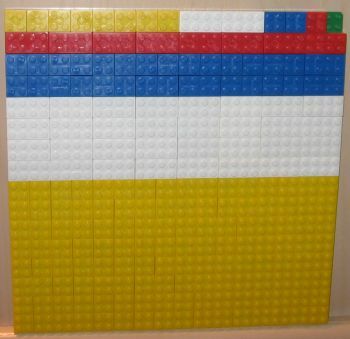 I added a picture of the “binary floor,” another Lego creation I had made but lost track of until recently. The ones are there, and the block models already are powers of two less one. Oh, now I see it. My bad. 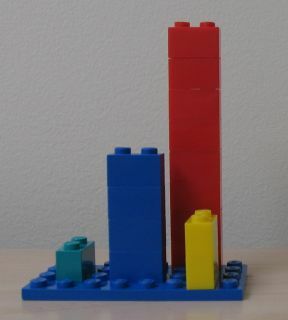 I was mislead by the fact that I counted the studs as units, while you seem to use two-stud blocks as units. I have seen several buildings in my city that have four rows of binary numbers stacked on the exterior walls. No one seems to no what they represent or why they are there. Any insight? Do you have a picture? What are the digits?